Frances Cunningham lives in Nashville, Tennessee, and for the last 20 years, has accompanied bagpipes, banjos, fiddlers, singers, and everyone who needed her brilliantly thought out chords behind them. 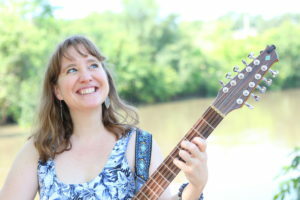 She is originally from Houston, Texas, and learned to play Irish music through guitarist Lloyd Gibson and flute player Turlach Boylan at their weekly sessions at McGonigel’s Mucky Duck. She went to high school at Houston’s High School for the Performing and Visual Arts where she studied the French horn and started playing at weekly contra dances with her friend Eden MacAdam-Somer. Frances toured the US with a Celtic rock band (SixMileBridge) in the mid-90s with her husband Sean Cunningham, who plays the flute and pipes. She discovered a talent for arranging tunes and songs together and especially for coming up with just the right chords and timing to make everyone she plays with sound great. In 2011 Frances joined the Mike Snider Band at the Grand Ole Opry and was the primary accompanist there for five years playing every weekend. In 2015 she joined the Piper Jones Band and has been touring and recording extensively with piper EJ Jones. In 2013 Frances won the Midwest Fleadh (traditional Irish music contest) in both tenor banjo and accompaniment and was the primary accompanist in the US for Shetland fiddler Lynda Anderson. Frances teaches workshops on accompaniment and illustrating the difference between Scottish, Irish, and American Old-Time tunes. After 20 years of accompanying other musicians, Frances is being backed up by some of her dear friends on this first album released under her name.